The four Kalamazoo peregrine falcon chicks were banded Friday morning May 20, 2016 by two Michigan Department of Natural Resouce bioloigsts over the protests of mother falcon, Rebecca. The youngsters were all in good shape and looked healthy according to the biologists who determined that there were two males and two females. 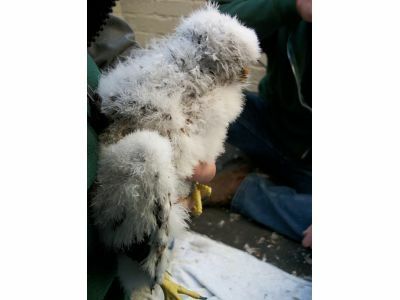 Read more at the following link and see the videos from the banding process in the Video Archive.